Passionate about music from her childhood, Gwenn Daniel studied the piano at the conservatoire while also maintaining a steady stream of musical activities beyond this. This young piano teacher's constant lively curiosity encourages us to discover music from all eras and in all styles. She is now putting her literary and musical talents to the service of Tomplay and enjoys helping you discover the history of the great classics and guiding you through the vast choice of scores offered by Tomplay. 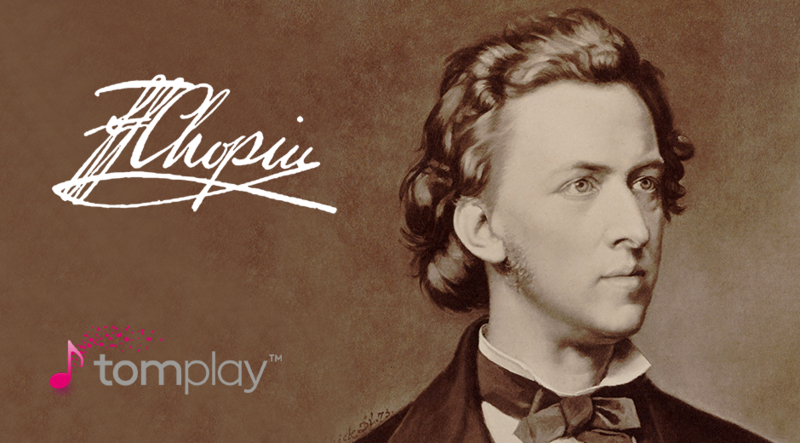 On the occasion of the 209th anniversary of Chopin’s birth, we wanted to share his fascinating life with you through ten of his greatest works. For each piece, we have included the link to the corresponding interactive score, allowing you to play the pieces and to listen to recordings of them by professional musicians. ⦁ Play the scores of the three movements of Chopin’s Piano Concerto No. 1 in E Minor, Opus 11, with a professional recording of the orchestra to accompany you. Frederic Chopin, whose mother was a Polish aristocrat and French father was a teacher, was born in Poland on 1st March 1810. Of their four children, he was the only boy. His mother, who played the piano and sang soprano, acquired the family’s first piano several months after the birth of little Frederic, who used to lie down under the instrument! He would listen to his mother playing for hours, quickly learned to play too and was sent to Wojciech Zywny, a piano teacher and friend of the family, who was sensitive enough to not force anything on him. He wrote his first composition, a Polonaise, at the age of seven and those around him very quickly realised that little Chopin had a quite remarkable talent for music. Then, in 1826, after his high school studies and without putting himself forward for the baccalaureate exam, he began his studies at the Music Academy in Warsaw. There, he was surrounded by attentive teachers, including Józef Elsner who taught him harmony and the theory of musical forms and dispensed him from piano lessons to avoid the other pupils being discouraged! The three years spent at the Conservatory would be the driving force behind an intensely creative period. Some years later, Chopin played his first piano Concerto at the Warsaw National Theatre and had already written the scores of what would be his second Concerto. Although this was a success and he was encouraged to write symphonies and other operas, Chopin did not do this. His particular relationship with the piano led him to compose almost exclusively for solo piano, as he found this instrument was sufficient in itself. Even so, he did not enjoy playing to a packed house. We are inviting you to discover the scores of the superb Piano Concerto No. 1 in E Minor, Opus 11, and to play your movement of choice, accompanied by the professional recording of the orchestra. ⦁ Play the piano scores of Chopin’s Mazurka No. 32, Opus 50 No. 3 and Mazurka No. 25, Opus 33 No. 4 and listen to the professional recordings of these pieces synchronised with the scores. Although he was enjoying growing fame in Poland, Chopin left Warsaw for Vienna in 1830 in order to make his name there. He was then aged twenty and it was heart-breaking for him, even though he travelled with Tytus, a close friend with whom he would exchange many letters during his lifetime. However, Tytus decided to return to Warsaw when a new insurrection broke out, but dissuaded Chopin from doing the same. This was another upheaval for the two friends. For Chopin, it was the end of an era. He left behind him his close friends and family, his family home and holidays in the countryside around Warsaw where he used to listen and dance to the traditional Polonaises and Mazurkas of his native country, fascinated by their rhythms and original melodies. This period in his life would be a life-long inspiration and the cradle for the composition of his Mazurkas, a truly personal musical diary. We are inviting you to play Mazurka No. 32 in C Sharp Minor, Opus 50 No. 3, an absolute masterpiece composed in 1840, inspired by his newly-acquired knowledge of counterpoint. You can also discover Mazurka No. 25 in B Minor, Opus 33 No. 4, a passionate and lyrical dialogue interspersed with periods of calm, composed two years earlier; it is a real treasure among Chopin’s Mazurkas. Take advantage of the professional recordings of the pieces synchronised with the scores and listen to them simply for pleasure or for inspiration. Tomplay’s interactive scores scroll automatically on your screen so that you never have to take your hands off the keys. ⦁ Play the piano score of Chopin’s Etude No. 12 in C minor 'Revolutionary', Opus 10 and listen to Maurizio Pollini’s interpretation synchronised with the score. After a turbulent stay in Vienna where Chopin was badly received and failed to find his place, followed by a month spent in Munich, he decided to travel to London via Paris and stopped off in Stuttgart, where he learned of Warsaw’s capitulation. This painful period was the inspiration behind the incredible Etude No. 12 in C Minor, Opus 10, nicknamed “The Revolutionary”. The technique of the left hand requires a great deal of skill, while the right hand expresses the same strength as a rallying war song. In order to master the left-hand part, you can adjust the tempo of the professional interpretation synchronised with the score, allowing you to work slowly and then more and more quickly, using the recording for support. ⦁ Play the piano score of Chopin’s Waltz No. 1 in E Flat Major, the ‘Grande Valse brillante', Opus 18 and listen to Alice Sara Ott’s interpretation synchronised with the score. On his arrival in Paris in 1831, Chopin’s experience was quite the opposite of that in Vienna: he was warmly welcomed in Paris and very quickly fell in love with the city. His period or torment was finally over, setting aside his growing illness: tuberculosis. In spite of this, he met with almost immediate musical success in the French capital. There, he met Félix Mendelssohn and even Franz Liszt, who became a great friend. He also had a very large female following, as Chopin was extremely attractive and could turn his hand to anything: music, drawing, poetry, he was a success at everything, was charming and had a good sense of humour! It was during this fulfilling time that he composed his “Grande Valse brillante”, the Waltz No. 1 in E Flat Major, Opus 18, which is available as an interactive Tomplay score with the ability to annotate the score or record yourself playing, to help you get the piece into shape in the best conditions. It is the first of Chopin's waltzes composed for solo piano. Its Parisian character contrasts with the composer’s habitual Viennese sentimentality and it’s easy to imagine the gaiety of an elegant evening in Paris when listening to it. ⦁ Play the score of Chopin’s Fantaisie - Impromptu, Opus 66 and listen to the professional recording of the piece synchronised with the score. In spite of his success with women, Chopin did not show the same interest for his companions as they did, until he met the one who would become his great love in 1836: Aurore Dupin, the novelist George Sand. He was not attracted to this woman, who wore trousers and smoked cigars, however: "Is she really a woman? I’m ready to doubt it! ", quoted Ferdinand Hiller in a letter to Liszt. Surprised by the enterprising behaviour of this independent woman to whom he was entirely opposed, Chopin finally gave in to her advances and they began a relationship, though it was kept secret at first. Two years before this idyll began, Chopin composed his very famous Fantaisie - Impromptu, Opus 66, whose exterior parts are characterised by heightened speed on a polyrhythmic system, while the central theme, with its tender, dreamy atmosphere, evokes that of a Nocturne. Play this sublime Fantasy - Impromptu with the professional recording of the piece synchronised with the interactive Tomplay score to help you and adjust the tempo so that you can easily put in place the polyrhythmic system with both hands. ⦁ Play the piano score of Chopin’s Prelude No. 15 in D Flat Major, ‘The Raindrop’, Opus 28 and listen to Martha Argerich’s interpretation synchronised with the score. George Sand decided to take Frederic Chopin and her children to Majorca, to be able to fully take advantage of their growing passion. But Winter in Chartreuse de Valldemossa is harsh with huge amounts of rainfall: her loved one’s illness came to the fore. Inspired by this rainy atmosphere, Chopin composed the “Raindrop” Prelude in D Flat Major. In her memoires, George Sand talks about the argument she had with Chopin when she told him that he was composing by simply imitating the sounds made by the raindrops on the roof, which enraged the composer! However, it was he himself who gave the, now very famous, nickname to his fifteenth Prelude. In order to help you master the subtle interpretation of this Prelude, we invite you to listen to the recording by Martha Argerich included in the Tomplay interactive score. This scrolls automatically on your screen with the reading cursor which allows you to follow the playing of the piece very easily. ⦁ Play the piano scores of Chopin’s Nocturne No. 13 in C Minor, Opus 48 No. 1 and Nocturne No. 15 in F Minor, Opus 55 No. 1 and listen to the interpretations by Maurizio Pollini synchronised with the scores. In 1839, Chopin found a brand new Pleyel piano, a surprise from his partner, when he arrived at Nohant, George Sand’s home. One year later, with his health quickly declining, he stayed many more times at Nohant, cherished and mothered by George Sand who, in spite of her partner’s more and more irascible moods, managed his touchiness and did everything to make him feel better there: she had his piano put in a dedicated room, had a padded door installed so that he would not be disturbed by the sounds of the lively household and gave him a bell so that he could call someone without making any effort. Chopin composed some of his most famous and most beautiful works at Nohant, including Mazurkas and Polonaises and other Ballads and Nocturnes. Discover the score of the majestic and tragic thirteenth Nocturne in C Minor, whose discourse and melody attract us irresistibly towards feeling of despair, increased by the gravity of the left hand, before making way to a more sustained whirlwind of revolt. The fifteenth Nocturne in F Minor is almost as melancholic as the thirteenth, except that it allows glimpses of rays of luminous sound before repeating its opening theme with variations. You can find the scores of these two Nocturnes in the Tomplay catalogue and use the recording by Maurizio Pollini to help you better understand the atmosphere in which Chopin was working at this time and which led him to such delicate interpretations. ⦁ Play the piano score of Chopin’s Waltz No. 7 in C Sharp Minor, Opus 64 No. 2 and listen to Maria-João Pires’ interpretation synchronised with the score. Chopin suffered the last dramas of his life during his last years: the deaths of several friends and, especially, the death of his father, which was very painful for him. In spite of this, he gave concerts and continued composing. Finally, it was his disagreement with the arranged marriage of Solange, George Sand’s daughter, which was the cause of their break-up, the latter not being able to cope with the fact that Chopin took her daughter’s part, which she saw as a betrayal. She cut off all ties with her daughter and sent Chopin away from Nohant in 1847. He was 37 years old. Frederic Chopin died in Paris on 17th October 1848, surrounded by Solange, his sister Ludwika, Adolf Gutmann and Thomas Albrecht, both friends of Chopin. Some of his last requests, such as having Mozart’s Requiem at his funeral, are legends. The last piece we want to invite you to play is none other than Waltz No. 7 in C Sharp Minor, Opus 64 No. 2, composed two years before his death, whose opening theme, suggesting doubt, finally makes way for a more optimistic rondo, with the end of the mischievous phrase recalling the light exit of a ballet dancer, which appears to be a good compromise for characterising the both tormented and wonderful life of the sensitive composer, Chopin. You can find the interactive score of this grandiose Waltz in the Tomplay Shop and take advantage of the recording of the interpretation by Maria-João Pires synchronised with the score, to listen to simply for pleasure or for inspiration.